The seatpost in question: A two-bolt, counter-tensioning post with protruding screw ends. The Specialized Toupé for better or for worse is a low profile saddle. It is one of those cut out saddles that ages fairly quickly, especially if you are at or over 170lbs. Aging or wear of most saddles results in a sag in the longitudinal plane of the saddle. If you hit a bump with the above situation (low-profile cut out saddle with protruding screw ends) that means “touch-down,” or in other words, hard contact of the bolts to very sensitive vascular and neurological tissues. Not good. Not even a good pair of chamois will save you. Specialized will counter with something along the lines of, ‘If you use our Specialized seatpost, a bolt-bottom-out won’t occur.’ This is true. Most Specialized seatposts are designed to minimize a bottom out moment with a sagging saddle. Trek has a similar seatpost – not sure who copied who. Sagging or low profile saddles can put you at risk for contact to an underlying seatpost. Close visual inspection will give you clues to potential tolerance of equipment. 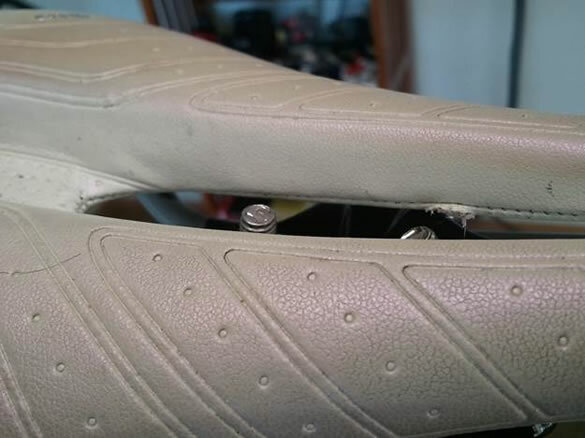 Check your saddle frequently for excessive wear along the length of the saddle. A saggy saddle will create body intolerances in many ways.